The Detroit Clinker Grinder is built for hostile operating environments. The Detroit Clinker Grinder is built for hostile operating environments. The rugged construction consists of rigidly stiffened rolled steel housing. The grinder enclosure is lined with cast Ni-Hard wear plates and grinder plates. The grinder teeth are all ni-hard cast and bolted for easy maintenance. 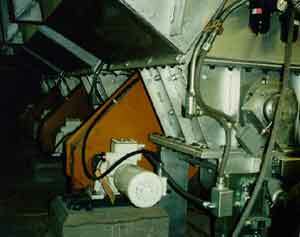 The crusher roll is supported by external flanged roller bearings. Grinder seals are designed to withstand high temperature continuous operation. While the grinder has been most often used in power plants to handle ash clinkers, it can also be used for a wide variety of other friable materials. The grinder teeth segments are cast from wear resistant Ni-Hard (500-550 BHN) and are easily replaceable without removing the grinder from its mounted position. Each tooth segment is bolted to the grinder shaft with 1" diameter socket head cap screws. To change a worn tooth segment, you simply remove the two cap screws of the worn tooth, remove the old tooth segment, insert a new tooth segment, and replace the two cap screws. The front shear plate and rear grinder plates are cast from Ni-Hard (500-550 BHN). The plates are factory shimmed to specific particle reduction requirements and can be adjusted to compensate for wear and particle size. Detroit Stoker Company, 1510 East First Street P.O. Box 732, Monroe, MI 48161. Tel: 734-241-9500; Fax: 734-241-7126.